On May 16, producer-composer Danger Mouse and Italian composer Daniele Luppi released Rome. This full-length LP features vocals from Jack White and Norah Jones and celebrates the scores of classic spaghetti western films, particularly those from legendary composer and conductor Ennio Morricone. Rome, meticulously assembled and gorgeous to the ears, is available for streaming courtesy of National Public Radio. 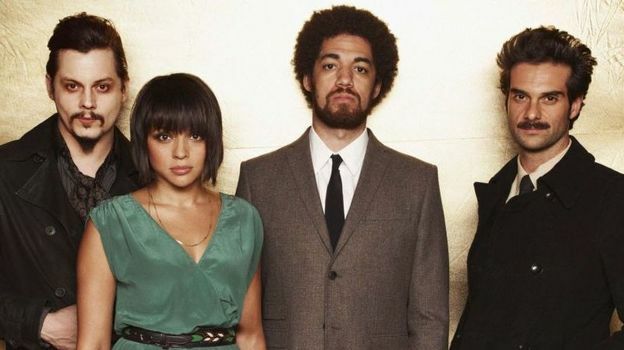 In the past decade Danger Mouse has become an ever-present figure in popular music. Here are some career highlights from the producer who is also known as Brian Burton. The Grey Album: Danger Mouse’s 2004 mashup of Jay Z’s Black Album and The Beatles’ White Album put him on the musical map. Although the album was intended to be heard by friends only, it quickly spread via the internet and was eventually named record of the year by Entertainment Weekly. Demon Days: The Grey Album got the attention of VSQ favorites Gorillaz, and the band’s Damon Albarn asked Danger Mouse to produce Gorillaz’ second LP, Demon Days. He did, and the record earned him a 2005 Grammy nomination for Producer of the Year. Gnarls Barkley: Danger Mouse first met Cee Lo Green in 1998 when he opened for Goodie Mob, in which Green was a member, at a concert at the University of Georgia. Although Danger Mouse gave Cee-Lo an instrumental demo tape at this event, it would be eight years before the two would collaborate as Gnarls Barkley. The group made two albums, 2006’s St. Elsewhere, (which included the mega-hit “Crazy”) and 2008’s The Odd Couple. The duo is reported to have another album in development. Broken Bells: Danger Mouse went indie for a collaboration with The Shins’ frontman James Mercer. The duo’s eponymous debut was released last March to much critical praise. A follow-up EP, Meyrin Fields, was released this past March. In his spare time, Burton produced Beck’s Modern Guilt and The Black Keys’ Brothers, among other albums. He is currently working on U2’s next album.